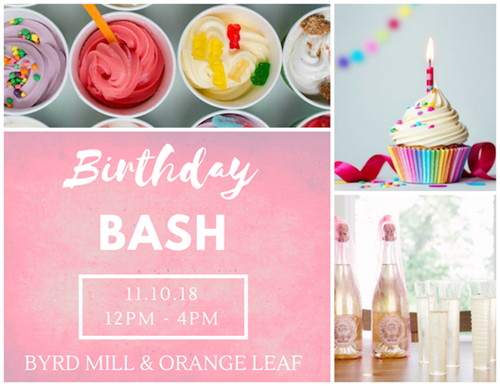 This event is Byrd Mill and Orange Leaf's first birthday! Our Birthday Bash will feature many family friendly events: Face Painting, Balloon Artist, Bounce House, Photo Booth, Willow Park FD Fire Truck, Blo Vintage Jewelry, Suzie Monzingo Art, House of Kirby florals, Coppola Wine Tastings, & Giveaways! Orange Leaf will also be offering buy-one-get-one frozen yogurt all day! Book signings by local authors... buy your books and have our local authors speak with you about their work of art!